Yet another version of Louisa May Alcott’s classic novel Little Women, first published in two volumes in 1868 and 1869, hits American TV this weekend. PBS Masterpiece airs the three-part miniseries version, which premiered in the U.K. last Christmas time. 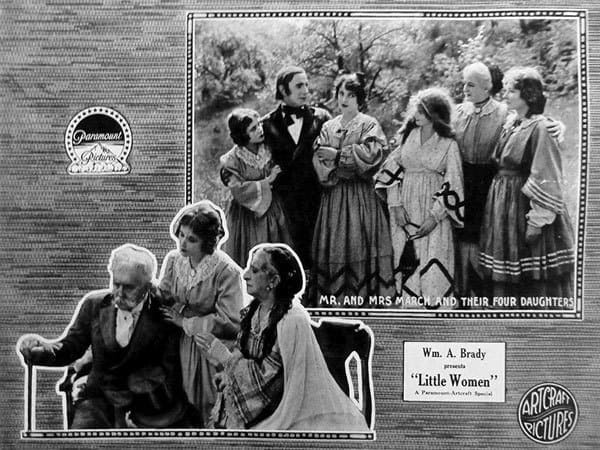 Since there’s no spoilers in classic literature just like there aren’t in history, we’re gonna #ThrowbackThursday to all the versions of Little Women that have already been filmed. At least the ones I can find pictorial evidence of! So let’s compare and contrast, why don’t we? 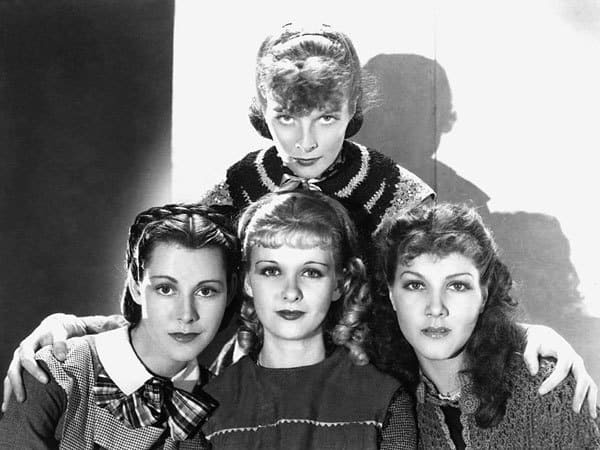 Dorothy Bernard is Jo, Isabel Lamon is Meg, Lillian Hall is Beth, and Florence Flinn is Amy. 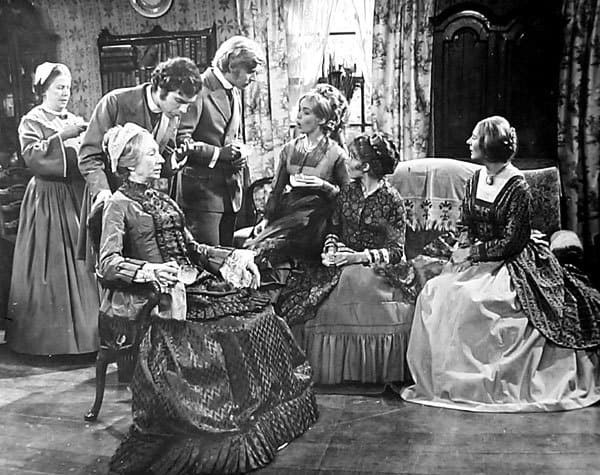 For a touch of authenticity, it was filmed in and around the Alcott family home in Concord, Massachusetts. 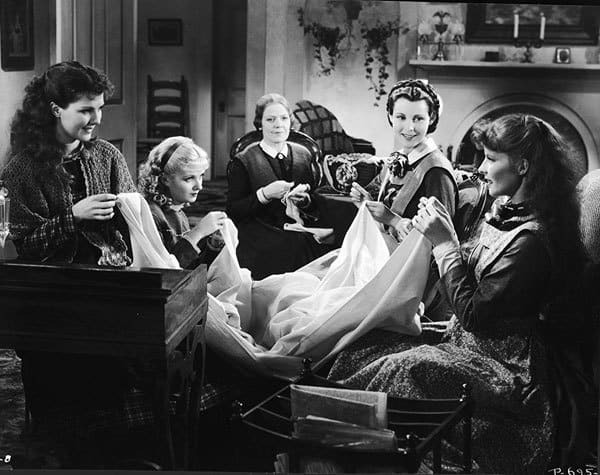 Katharine Hepburn as Jo, Frances Dee as Meg, Jean Parker as Beth, and Joan Bennett as Amy in this first big Hollywood version. Costumes by Walter Plunkett include a dress for Hepburn copied from a tintype of her maternal grandmother. And a colorized still so you can see that Amy is blonde! 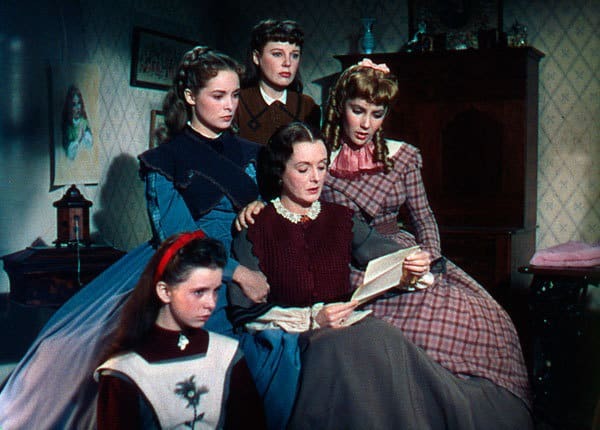 June Allyson plays Jo, Janet Leigh plays Meg, Margaret O’Brien plays Beth, and Elizabeth Taylor plays Amy in this first color version of Alcott’s tale. The movie features the two ‘best cryers’ at MGM (Allyson and O’Brien), plus costumes by Walter Plunkett (again!). Allyson is a spunky Jo. Who spars with Peter Lawford’s Laurie. Angela Down is Jo, Jo Rowbottom is Meg, Sarah Craze is Beth, and Janina Faye is Amy in this nine-part BBC series. 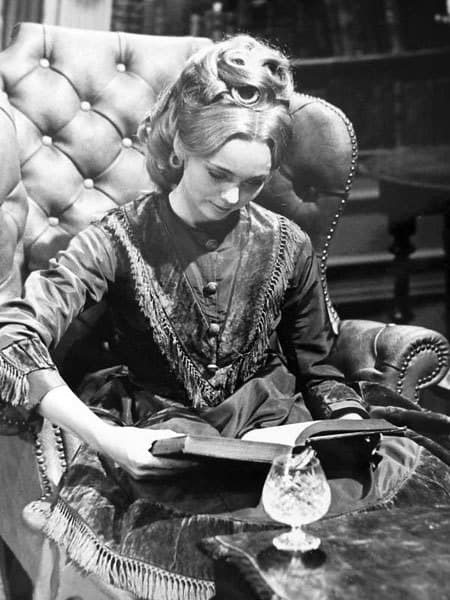 There were several TV adaptions in the ’50s and ’60s, which have been lost, and this was the first major TV version. The ’70s BBC went for elaborate Victorian costumes. Janina Faye’s Amy looks rather posh. Susan Dey plays Jo, Meredith Baxter Birney playsMeg, Eve Plumb plays Beth, and Ann Dusenberry plays Amy. Americans who watched a lot of TV in the ’70s and ’80s may recognize those actresses from The Partridge Family, Family Ties, and The Brady Bunch, among other things. 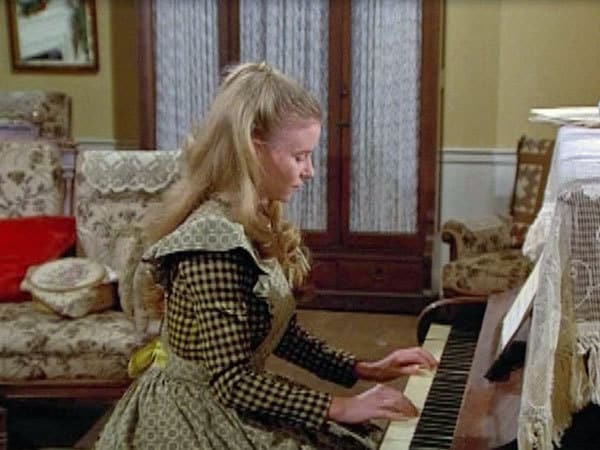 Beth’s fancy ballgown is more 1970s than Civil War era. This was apparently broadcast in the U.S., and somebody will complain if I don’t include it! Another animated version, something of a sequel. Just being a completist here. 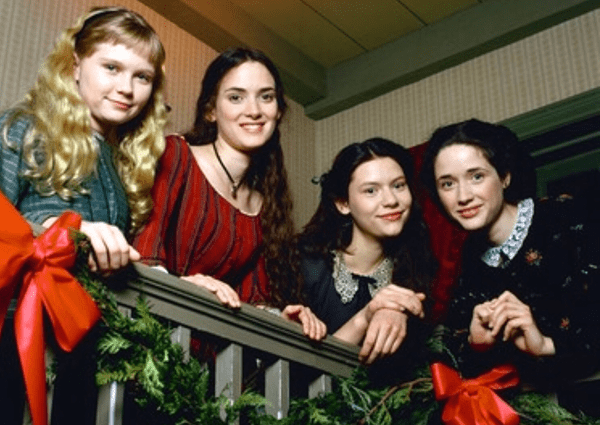 Winona Ryder as Jo, Trini Alvarado as Meg, Claire Danes as Beth, Kirsten Dunst as young Amy, and Samantha Mathis as older Amy. 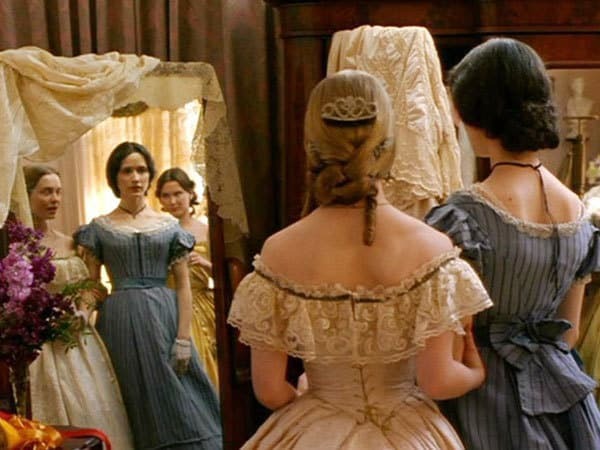 Y’all know this one, if not for the star-power of the actresses then for Colleen Atwood‘s Oscar-nominated costumes. Meg gets jealous (and we get to see pretty gowns by Colleen Atwood!). 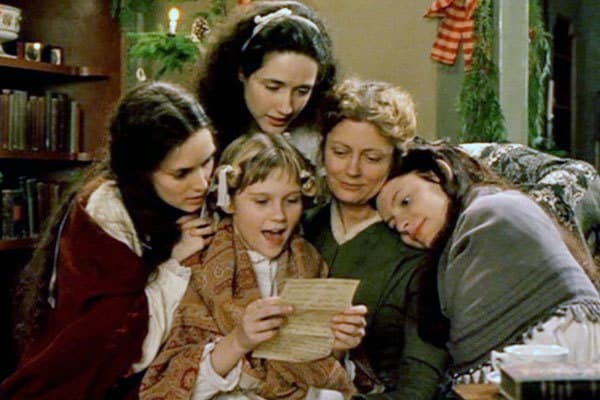 What’s your favorite version of Little Women on screen? The 1994 version is one of the first films I remember seeing as a child! But when I tried to re-watch it on Netflix the other day, I simply couldn’t because I feel Winona Ryder is so off in this. Not only is she so undeniably petite and dainty (I know the viewers will never agree about who’s more beautiful than who, but can we not at least get the objective characteristics such as being tall) but also there’s sort of a nervous energy about her manner. As if Jo is secretly grinding her teeth, or as if the whole “boisterous tomboy” thing is façade and she’s actually ready to burst into tears at any moment. I don’t know if anybody else feels that way. I can’t help but love Hepburn as Jo March, but my favorite adaptation is the one from 1994. I can’t stand June Allyson and have a hard time believing Elizabeth Taylor as a blonde. I am really looking forward to BBC’s new version. I can’t stand Hepburn as Jo. The heavy makeup and high cheekbones make her look like a beauty queen instead of a tomboy, and I just cannot believe her as a teenager. 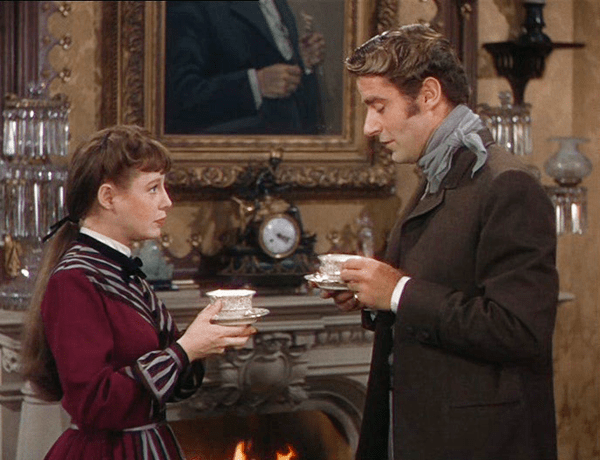 It’s ironic that although there have been so many versions of Little Women, there has yet to be one that gets it right. That everyone has strong opinions pro/con about each version is apparently why they keep making more! No version is perfect for everyone, I guess. I’d probably say that the 1994 version is my favorite so far, and I’m looking forward to this new one on Sunday. 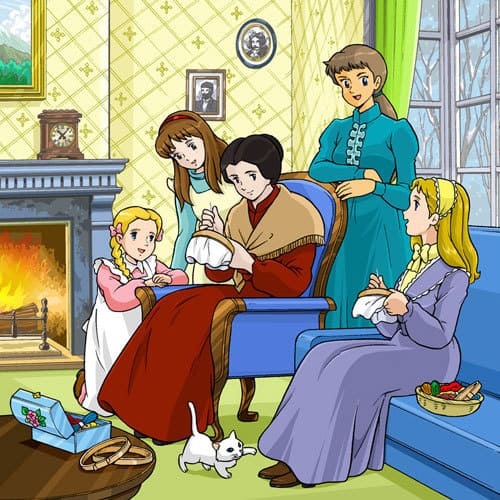 I haven’t seen the anime versions of Little Women but I have seen all 3 movies and both the British and the American miniseries. 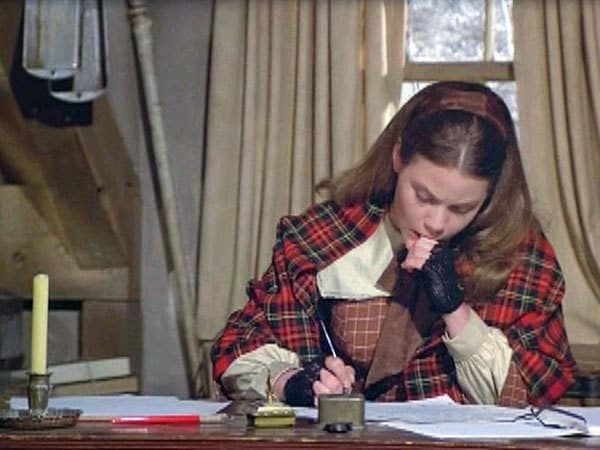 I remember loving Susan Dey as Jo and William Shatner as Professor Bhaer! The BBC miniseries is awful, none of the actors can do a credible American accent. 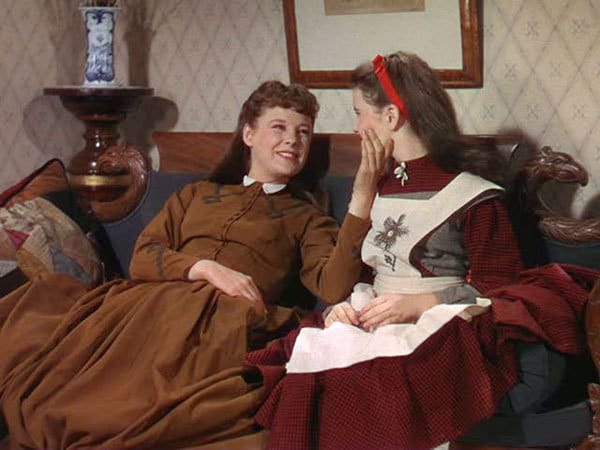 I will always have a soft spot for Katherine Hepburn as Jo, although she’s more Louisa May Alcott than she is the author’s version of Jo. I vaguely remember the 1994 movie, I’ve never been a huge Winona Ryder fan, but I did really like Christian Bale as Laurie and Gabriel Bryne as Professor Bhaer. I have seen the new version, and my favorite is still from 1994. For some odd reason, though the new miniseries has an additional hour to flesh out the plot, it still feels rushed to me, and they didn’t bother to develop the professor… at all. Like, AT ALL. Looking at the above, I want something that hasn’t yet been on screen (as far as I know.) Alcott’s “Hospital Sketches” comes to mind, or a biopic of when her dad set up a poorly planned utopian community, the Fruitlands. The Fruitlands would be interesting from a costuming standpoint, as two of the rules were 1) vegan materials only, and 2) NO COTTON. For me it’s the 1994 version with Colleen Atwood’s costumes. And Trini Alvarado as Meg and Samantha Morton as Amy grown up. Not to mention Claire Danes’ luminescent Meg. Winona Rider as Jo. I loved this movie so very much -except- I just thought that Winona Rider was all sorts of wrong as Jo. I always thought that she and Claire Danes should have swapped roles. 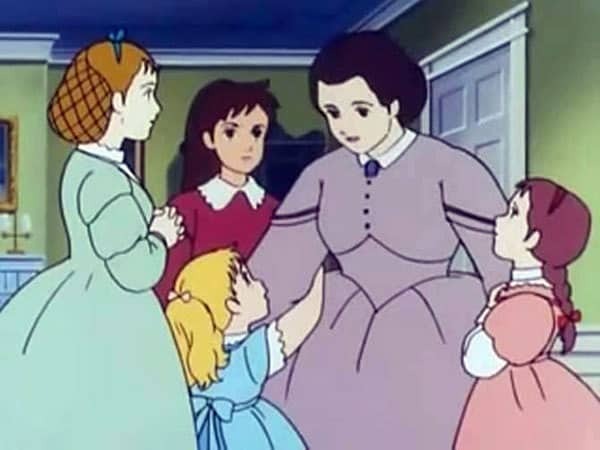 I’ve seen the 1987 anime version of Little Women and to be honest its the one that gets the spirit of the book just right. Plus they added other plots that seems reasonable and made Hannah, an African-American to highlight the racial issues that period. Though animated, Jo here is the perfect one for me. The 1978 version was the first one I had seen. But the 1994 version is my favorite. The 1994 film (directed–ahem!–by Gillian Armstrong, whose work I love and who should always be acknowledged) is pretty good; I like that the script opened up the story so Jo talks about her parents’ being part of Emerson’s Transcendentalist circle, as were the Alcotts. But I agree that Ryder isn’t physically right for Jo; in general, she seems too contemporary. I did love Claire Danes’ Beth. Anyway, L.W. was one of my role-model books when I were a lass, and I can’t wait to see the new version. 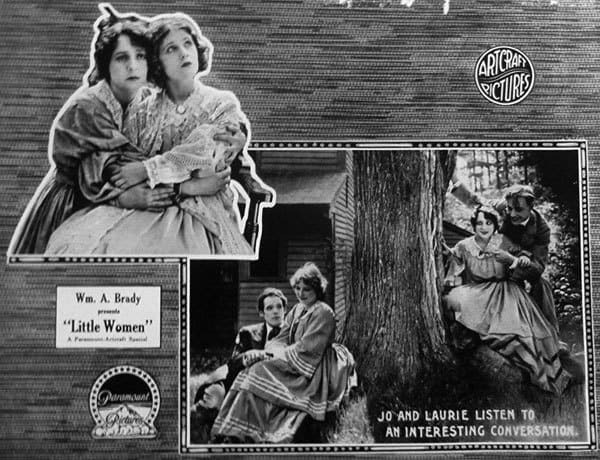 We had a vhs tape of the 1949 that is little women for me. But the 1994 one did not feel wrong to me, so it gets high marks too. 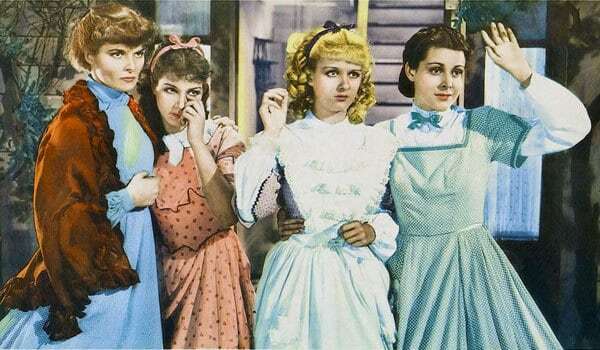 I love June Allyson as Jo, but they switched Beth and Amy so that Beth was the youngest, which is just so inaccurate. I agree that none have really gotten it right. 1994 probably comes closest to the book, but I love the casting of the four girls, Marmee and Mr. Baer in the new BBC one, even if the storytelling isn’t accurate to the book.